Toadstools, Mandrake, and African Death’s Head Hawksmoth, Oh My! It is the 9-day Quedlinburg festival of quack doctors. Purchasing good ingredients for your brew can help you make the best “healing” ointments in the land, winning you fame and fortune! You can use that fortune to buy even more powerful ingredients to put into your pot. But be careful, one ingredient too many and your potion will explode! 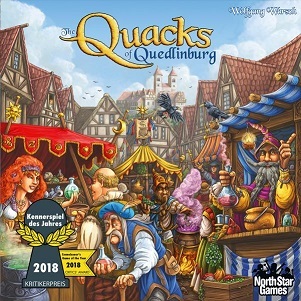 Winner of the 2018 Kennerspiel des Jahres, The Quacks of Quedlinburg perfectly blends deck, i.e. ‘pot’, building strategy with a press your luck element that ratchets up the excitement each turn as the stakes get higher.